The lives of these hunger strikers are in a grave danger and the supposedly radical Syriza Government is following exactly the same policies of its predecessors in continuing repression. 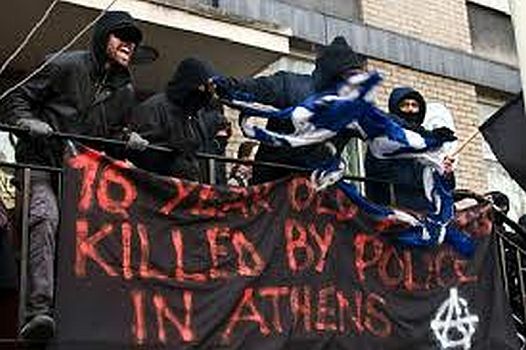 _“Traditionally, all Greeks are generally against the State (from the far Left to the far Right - the State is seen as a legal robber and oppressor of the individual). Today [1st April] the hunger strike of 22 political prisoners, which began on March 2nd, is in its 30th day. It is clear that not only the health but even the lives of the hunger strikers are at a critical juncture, at a critical limit. This is confirmed by the medical statements. The same fact has already been pointed out by the resolution of the General Assembly of Physicians of the General State Hospital of Nicaea (Athens), which in a recent resolution (30/3) calls for the immediate satisfaction of the demands of the hunger strikers. In this struggle they stand with the political prisoners from Turkey who are incarcerated in the prisons of the Greek bourgeois state, and have begun a rolling hunger strike as a demonstration of international solidarity in action. We want to state publicly, adding our voice to the solidarity movement, our support for the just demands of the hunger strikers and political prisoners and to express our whole-hearted solidarity with the ultimate form of struggle that they have chosen. It is true that ideologically there is a real historical and political gulf between our views and the views of the hunger strikers, as well as with the anarchist milieu in general. As for the tactics of ‘individual terrorism’ we have expressed our explicit opposition in our programmatic theses and in texts that we have published. However, this gulf can be perfectly bridged in our common radical opposition to the bourgeois state and capital, the project of the abolition of the exploitation of one person by another and the creation of a society without classes; not to speak about their demands, which are just and completely interwoven with the necessary aims of the proletarian class movement. In any case, unconditional solidarity with the enemies of the bourgeois state is for us a question of principle; a position that expresses the historical interests of the working class and a conquest of the revolutionary movement. We denounce the attitude of the social democratic Syriza government, which as a backbone and administrator of the system has proved in just two months, after its anti-Memorandum and anti-authoritarian rhetoric, to be just another servant of the interests of capitalism and continuator of the bourgeois authority. And its wretchedness is shown outright by what it hypocritically claimed when it was in the opposition over Nikos Romanos’ hunger strike when it denounced prisons, state repression and the ‘anti-terrorist’ legislation. This is just what it is now doing against the current hunger strikers, who at the very end demand nothing more than the immediate and real implementation of the relevant pre-election promises of Syriza as well as the essential demand of non-criminalisation of … anyone just because of who they are related to. Finally, shame on the ‘far left’ pro-Syriza supporters who have pretended not to understand for such a long time. Pen name of Abele Rizieri Ferrari an individualist anarchist in the style of Max Stirner (“The Ego and His Own”) and influenced by the likes of Frederick Nietzsche. He was killed by the Italian carabinieri in 1922 (age 32) and is most famous for his book “Towards the Creative Nothing”. maybe someone has a critique.